I was in Charlie Company from August 1969 to Feb 1970; I reinlisted and was a door gunner in the 158th Aviation Battalion. I stayed in the Army for a few years after VN. Camp Evans was our base camp for the 1/506th Infantry 101st Airborne Division. Our AO was the Ashau Valley. 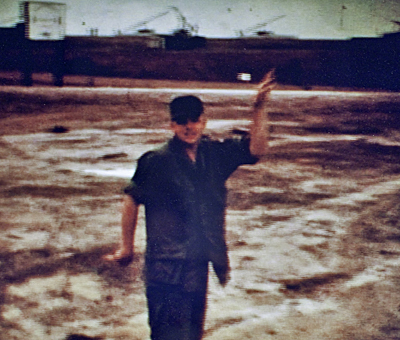 Camp Evans was between Hue and Quang Tri. We stayed in the field on missions for 30 days at a time. After the 30 day mission, we would return to our base camp for haircuts, showers, hot food, and clothes. We would stay in the rear for three days and then go out on another 30 day mission. This continued over and over again. Around September 1969, my platoon was airlifted to an area to the north which we called the “Rock pile.” It was a large mountainous area that had many caves. One of our platoons was already deployed there and came under attack from the enemy. We landed in a valley below the rock pile and made our way up the other side of the mountain to surround the enemy. As we approached about midway up, we ran into some large cave entrances where we found a large cache of rice, 122 mm rockets, and medical supplies. We left a few troops there to guard the entrances and we continued around the mountain to join up with the other platoon when we started taking fire from a ledge above us. During this firefight, we tried to out flank and because of the terrain, a few of us got tangled in some vines and fell down the hill, about 25 feet. During the fall, I remember a stick hit me in the chest near my throat. Later I found that my dog tag was missing. I got a replacement dog tag next time I was in the rear. I had one around my neck and one on my boot. [from a recent email:] I have just finished reading the document of the history on the web site again. I remember the incident with Le Van Sau when he shot the enemy at the rock area in Oct 69. I was assigned as his keeper when I came into country. I was behind him when the enemy was spotted, I could understand Sau enough to know what he was saying He was telling the enemy to give up or he would shoot, he kept telling him to give up but he wouldn't. What ever happen to Le Van Sau ? I also remember hauling all of the bags of rice to a LZ, and the rockets to an area to be exploded. 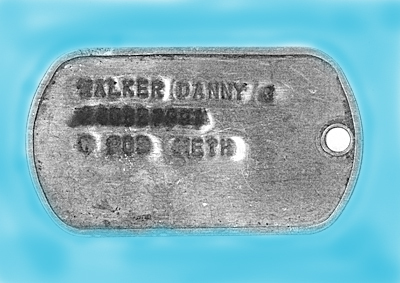 I got my dog tag back in 2005. In 1994, a nurse who had served in Viet Nam during the war noticed a street vendor selling about 1,500 dog tags. She thought that these might belong to missing service men so she purchased the lot and reported them to the US MIA office in Hanoi. It turns out that most of the dog tags were fake but not all. As the US left Viet Nam in 1975, a few dog tag embossing machines were left behind. Enterprising Vietnamese made new tags and started to sell them to tourists. My dog tag made it to the vendor and I was tracked down by the Joint POW / MIA Accounting Command at Hickham AFB, Hawaii.